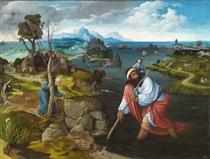 Joachim Patinir, also called Patenier (c. 1480 – 5 October 1524), was a Flemish Renaissance painter of history and landscape subjects. He was Flemish, from the area of modern Wallonia, but worked in Antwerp, then the centre of the art market in the Low Countries. 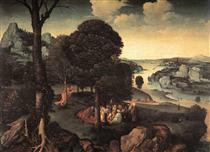 Patinir was a pioneer of landscape as an independent genre and he was the first Flemish painter to regard himself primarily as a landscape painter. He effectively invented the world landscape, a distinct style of panoramic northern Renaissance landscapes which is Patinir's important contribution to Western art. There are only five paintings signed by Patinir, but many other works have been attributed to him or his workshop with varying degrees of probability. The ones that are signed read: (Opus) Joachim D. Patinier, the "D" in his signature signifying Dionantensis ("of Dinant"), reflecting his place of origin. 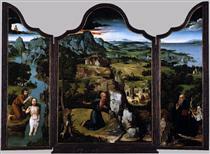 The 2007 exhibition at the Museo del Prado in Madrid contained 21 pictures listed as by Patinir or his workshop, and catalogued a further 8 which were not in the exhibition. 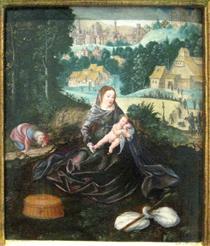 Patinir was the friend of not only Dürer, but with Quentin Metsys as well, with whom he often collaborated. 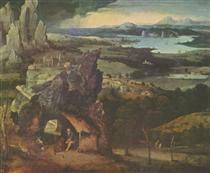 The Temptation of St Anthony (Prado) was done in collaboration with Metsys, who added the figures to Patinir's landscape. His career was nearly contemporary with that of the other major pioneer of paintings dominated by landscape, Albrecht Altdorfer, who worked in a very different style. 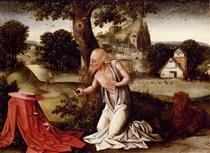 He was probably the uncle of Herri met de Bles, who was his follower in establishing the world landscape. Originally from Dinant or Bouvignes in present-day Belgium, Wallonia, Patinir became registered as a member of Antwerp's painters’ guild Guild of Saint Luke in 1515, where he spent the rest of his life. He may have studied with Gerard David at Bruges, who had been registered as a guild member in the same year as Patinir. In 1511, Patinir is believed to have travelled to Genoa with David and Adrien Ysenbrandt. 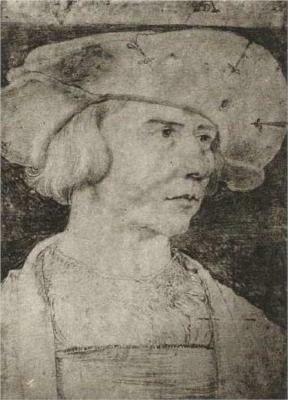 In 1521, Patinir's friend Albrecht Dürer attended his second wedding and painted his portrait. 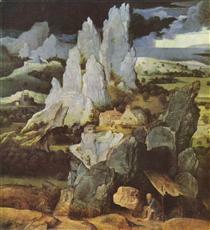 Dürer called Patinir "der gute Landschaftsmaler" ("a good painter of landscapes"), thus creating a neologism translated later into the French. 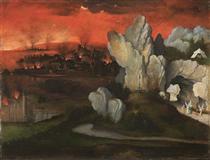 Patinir often let his landscapes dwarf his figures, which are of very variable quality. The larger ones were at least sometimes painted by other artists. Such specialisation had become common in the Low Countries at the time. Many of his works are unusually large for Netherlandish panel paintings of the time, as are those of Hieronymus Bosch, another painter of large landscapes, from a generation earlier. Patinir's immense vistas combine observation of naturalistic detail with lyrical fantasy. The steep outcrops of rocks in his landscapes are more spectacular versions of the group of very individual formations just around his native Dinant; these became a part of the world landscape formula, and are found in the works of many painters who never saw the originals. His landscapes use a high viewpoint with a high horizon, but his grasp of aerial perspective is far from complete. 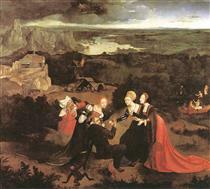 He uses a consistent and effective colour scheme in his landscapes, which was influential on later landscape painting. The foreground is dominated by brownish shades, while "the middle ground [is] a bluish green and the background a pale blue", creating an effective sense of recession into the distance; "When combined with the frequently hard-toned browns, greens and blues that alternate with significant areas of white, a sense of impending doom is created by the threatening clouds, the capricious and sharply pointed contours of the rocks and the crowding together of natural elements." 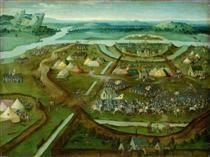 Battle of Pavia Joachim Patinir ? 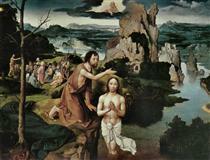 Landscape with St. John the Baptist Preaching Joachim Patinir ? 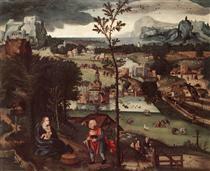 Landscape With The Penitent Saint Jerome Joachim Patinir ? 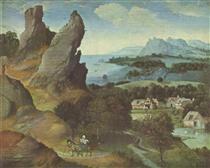 Landscape with the Rest on the Flight Joachim Patinir ? 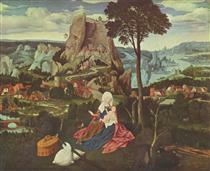 Rest of the Holy Family on the Flight into Egypt Joachim Patinir ?